The Rise of the Necromancer pack "draws ever closer". If you're lucky, you'll have already taken the Necromancer for a spin via a recent closed beta for Diablo 3, while the rest of us will have to wait until Blizzard finally releases the long-teased Rise of the Necromancer pack. That pack will whack in "several new cosmetics, two additional stash tabs, two additional character slots," as the Diablog helpfully reminds us, not to mention that new class, the Necromancer. The pack will coincide with Patch 2.6.0, which is set to add two new Adventure Zone modes, new Challenge Rifts and more. There's no date for either of them yet, but thanks to today's bit of teasing, we may now watch the Necromancer's opening cinematic—both the male and female variants. 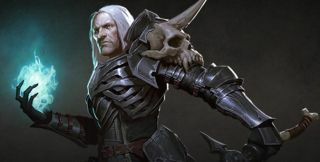 More Necromancer news is "on the horizon", according to Blizzard, so hopefully we won't have too long to wait for that.